Activists with Planned Parenthood demonstrated in support of a pregnant 17-year-old being held in a Texas facility for unaccompanied immigrant children, outside of the Department of Health and Human Services on Friday. The girl has requested access to abortion services. 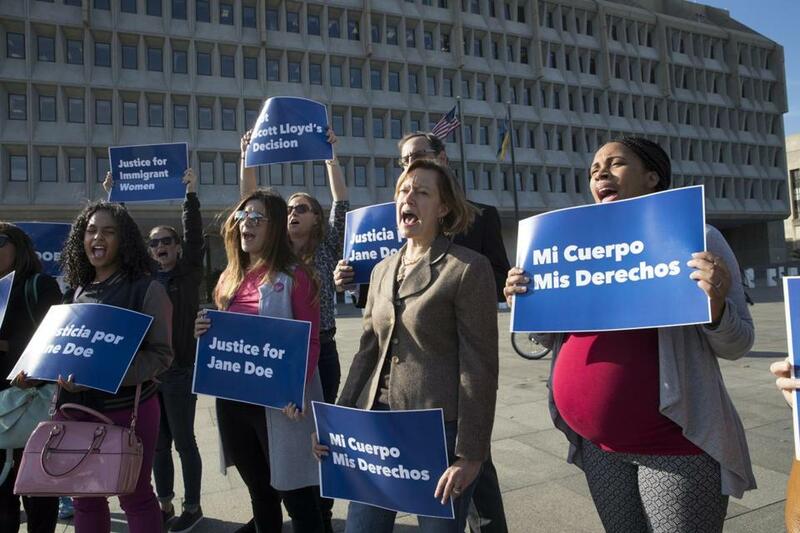 WASHINGTON — Federal judges weighing the case of a Central American teenager seeking to end her pregnancy decided Friday to temporarily block her request to obtain an abortion while in custody in Texas. After hearing arguments, the US Court of Appeals for the D.C. Circuit ruled that the government should have until the evening of Oct. 31 to release the teenager to an adult sponsor. If released, the teen could obtain the procedure. The judges acknowledge that finding a sponsor in the United States to take custody of the teen, who is being held in Texas after crossing the border illegally, may not be feasible in time for her to terminate her pregnancy. She is 15 weeks pregnant, and Texas bans most abortions after 20 weeks. ‘‘We’re at a point where days matter,’’ Judge Patricia Millett observed during the hearing. Lawyers for the government said they are not denying the teenager the right to abortion guaranteed by the 1973 Supreme Court ruling Roe v. Wade, because the girl could voluntarily leave the United States and try to seek an abortion elsewhere or find a sponsor to live with in this country. At oral argument on Friday, Judge Brett Kavanaugh pressed the government’s attorney several times about why it appears to have a different policy for the teenager, who is identified in court papers as ‘‘Jane Doe,’’ than it has for pregnant women locked up in federal prison and for adult women in immigration detention. For those women in federal custody, he noted, the government does facilitate abortions. The teen has said she is willing to pay for the procedure. Undocumented immigrant minors are overseen by the Department of Health and Human Service’s Office of Refugee Resettlement. Under the Trump administration, that office has actively discouraged teens in its custody from having abortions, according to court filings. The government’s lawyer, Catherine Dorsey, told the court Friday that incarcerated women do not have the same options as the pregnant teen: returning home to seek an abortion or finding a legal sponsor. But she also acknowledged publicly for the first time that abortion is illegal in the teenager’s homeland. The name of that country has been withheld to protect the teen’s privacy. Dorsey struggled at times to answer the judges’ questions, repeatedly saying, ‘‘I don’t know’’ and declining to state whether the government believes the teen has a constitutional right to an abortion. ‘‘Even if she has that right, we don’t have to facilitate it,’’ Dorsey said, adding that government officials are ‘‘looking out for the best interest of the minor child’’ in federal custody. Brigitte Amiri, a lawyer with the ACLU who is representing the teenager, told the court that two potential sponsors had already fallen through and said the often lengthy process of approving a sponsor includes background checks and possible a home visit. She urged the court not to set aside its obligation to protect the teen’s constitutional right to abortion just because she may eventually obtain a sponsor, and said the government is not acting in the teen’s best interest. A state judge in Texas ruled in September that the teen could bypass the state’s parental consent requirement to obtain an abortion. Millett suggested that a federal policy should not override the decision of a state court judge. The appeals court allowed the teen to undergo the counseling Texas law requires on Thursday, as ordered by the lower court judge. But the panel has temporarily blocked that judge’s order to allow the abortion to proceed. Roughly 40 people gathered Friday morning in front of the Department of Health and Human Services to demand ‘‘justice for Jane.’’ Brought together by Planned Parenthood, the ACLU, and the National Latina Institute for Reproductive Health, the protesters hoisted signs and sang chants in Spanish and English showing solidarity with the teenager, and expressing contempt for Scott Lloyd, director of the Office of Refugee Resettlement. ‘‘The constitutional right to abortion does not depend on your immigration status,’’ said Georgeanne Usova, legislative counsel for the ACLU. The pregnant teenager faces a ‘‘cruel clock that is ticking rapidly,’’ said Bethany Van Kampen, a policy analyst for the National Latina Institute for Reproductive Health, given that Texas prohibits most abortions after 20 weeks. ‘‘Where is the voice for Jane? Where is the humanity for Jane?’’ she said.